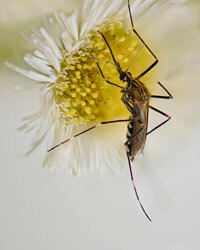 The Center for Vector Biology focuses on mosquitoes and other insects that affect public health. The center's scientists conduct basic and applied research to better understand and address these pressing societal issues. The Center for Vector Biology investigates the life histories and habits of insects that transmit disease, as well as best management practices for controlling them. It provides county and state professionals with science-based recommendations for managing mosquitoes and other potential disease vectors. The center also provides New Jersey residents with accurate and environmentally sound information on issues of pest management related to human health. The center's surveillance activities help reduce human and equine cases of vector-borne diseases. As the center proactively develops and disseminates new knowledge about best management practices of other health-threatening insects, residents reap the benefits of environmentally sound pest control. Various industries, such as tourism and agriculture, are better protected against economic losses from insect vectors and the diseases they transmit. The protection of state residents against disease avert health care expenses both for individuals and the state. As center scientists develop collaborations with scientists around the world, these benefits are felt beyond New Jersey. The center was established within the School of Environmental and Biological Sciences at Rutgers University in 2007. Nevertheless, the program has a long and illustrious history rooted in vector biology and control. Rutgers Professor John B. Smith's seminal book on mosquitoes in 1904 heavily influenced research and control programs worldwide. Smith's pioneering legislation, passed by the New Jersey legislature in 1906 and 1912, led to a broad program of mosquito control throughout the state, laws that were widely emulated nationally and continue to influence mosquito control activities. Following Smith, the Mosquito Research Unit was formed and led in turn by Professors Thomas Headlee, Daniel Jobbins, Donald Sutherland, and Wayne Crans. The unit established a strong tradition of working closely with New Jersey vector control professionals that continues today. We foster and seek to act as a focal point for multidisciplinary cooperation with a range of diverse public health personnel in county, state, and university units possessing interest in vectors and pathogens of public health importance.